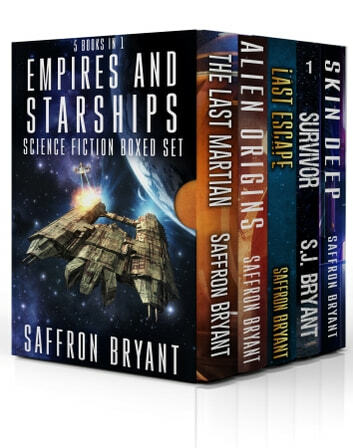 A value-pack of Saffron Bryant's most popular titles. Whether you're looking for interstellar bounty hunters, kickass heroines, action, adventure, or just a fun read - this is the set for you. Survivor: For eons a dark force has lurked inside Archalon, waiting. In 2354, the Confederacy set it free. Now Nova is the only one standing between the human race and total annihilation. Last Escape: An underground organization is forcibly harvesting emotions from innocent people-who will stop them? Skin Deep: Ravyn must defeat a corrupt government with just the help of seven dysfunctional robots. The Last Martian: One man alone in space. Time is short, and space is deadly. Alien Origins: The truth behind the origins of human civilization has laid buried for centuries. Until now. 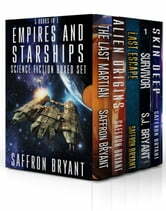 Empires and Starships is an action-packed collection of 5 sci-fi books that will have you hooked. Get your copy today!